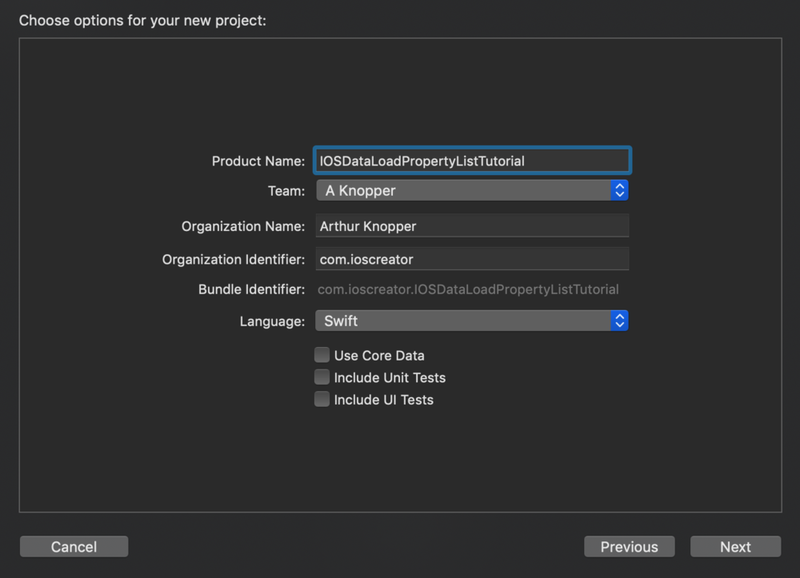 For product name, use IOSDataLoadPropertyListTutorial and then fill out the Organization Name and Organization Identifier with your customary values. Enter Swift as Language and choose Next. Remove the View Controller from the Storyboard and drag a Navigation Controller to the empty canvas. When the initial View Controller is deleted there isn't a starting point defined. Select the Navigation Controller and go to the Attribute Inspector. In the View Controller Section select the "Is Initial View Controller" checkbox. Double-click on the Navigation Bar in The Table View Controller and set the title to "Devices". Select the Table View Cell and go to the Attributes Inspector. In the Table View Cell section set the Identifier to "Cell". Since we have deleted the View Controller from the Storyboard we can also delete the ViewController.swift file. Add a New File to the project, select iOS->Source->Cocoa Touch Class. Name it TableViewController and make it a subclass of UITableViewController. Open the property list. Right-click and Select Add Row. Add an Array named AppleDevice containing multiple Strings. When you select the TableData.plist file, and open it as source code , you can view the created XML code. let path = Bundle.main.path(forResource: "TableData", ofType: "plist")! Build and Run the project, the devices loaded from the property list should be displayed inside the Table View. You can download the source code of the IOSDataLoadPropertyListTutorial at the ioscreator repository on Github.